Joseph Burrows was the son of John Burrows of Buckingham and Hannah Smith who had married at Tingewick in April 1839 – he was the second of their five children, four of whom were boys. Until his first marriage (probably just after the 1871 census), he lived with his parents and siblings in Buckingham; ten years later he was a general labourer in Tower Hamlets, London, with his first wife and two children. In 1891 he was a widower, still in Tower Hamlets but soon afterwards he married again and by 1901 he had another son under ten years old. 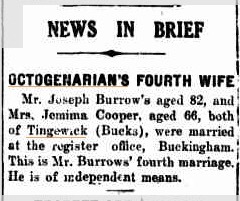 That wife retired with him to Tingewick before the 1911 census (where he describes himself as a “retired dock labourer”; presumably she died, he married, and was widowed a third time before his marriage to Mrs Cooper in 1925. Jemima and her first husband – Abel Cooper – were both born in Chipping Norton, Oxfordshire. The first of their five children was born in Cornwall, the next back in Chipping Norton, the third in London. Around 1896, they moved to Tingewick, where Abel worked as a labourer before becoming a beer retailer in Cross Lane from around 1907 to 1915. Joseph Burrows died in the third quarter of 1830.